Another big day for leavers, with no fewer than seven dogs setting off for a new life in Belgium. The name Animal Trust might ring a bell with people who have been following us for a while. It is a private refuge which has taken dogs from the ScPA several times before. Eline, who runs the place, got in touch with DRC last month to offer to take some dogs to look after until they could be rehomed. Naturally, subject to the agreement of the ScPA board, we jumped at the chance! Animal Trust has amazing facilities. I have visited several times, and we have feet on the ground as I am in contact not only with Eline but also with several of their volunteers, as well as people who have adopted “Frenchies” and who have kept in touch since. The name Todd springs to mind, of course, but there are many others….Canaille, and (sniff) Girafon, plus Venusio, Flash…there are many others. Animal Trust oversees wonderful adoptions and keeps in touch for ever. And just as importantly, while dogs are waiting, they have a wonderful life, as the facilities are second to none. Eline asked for a list of dogs who needed her the most. So that was long termers, but also “invisible” dogs. She intended to take three, and ended up with seven! And I am sure in her heart she would have taken more. But she is often called upon to take dogs from mistreatment cases, and has many other dogs to look after as well. This morning at just after 06H00 the Lucky Seven were on their way, complete with TRACES documentation, and in the safe hands of Christian of STIAC Transport. They are due to arrive in the wee small hours tonight, and will soon be settling into their new luxury accommodation. Sometimes all a dog needs is a chance to be seen by different people, and breeds that are hard to home here (griffons and the long eared hunt types, for instance) are seen as exotic in Belgium. And sometimes they don’t even need to go very far. Two of the dogs who left the ScPA for Montpelier have been adopted already, they just needed a new “audience”. Huge thanks to Eline. I have to say, my little heart leapt with joy when I got her message offering to take some dogs. They are in very good hands. 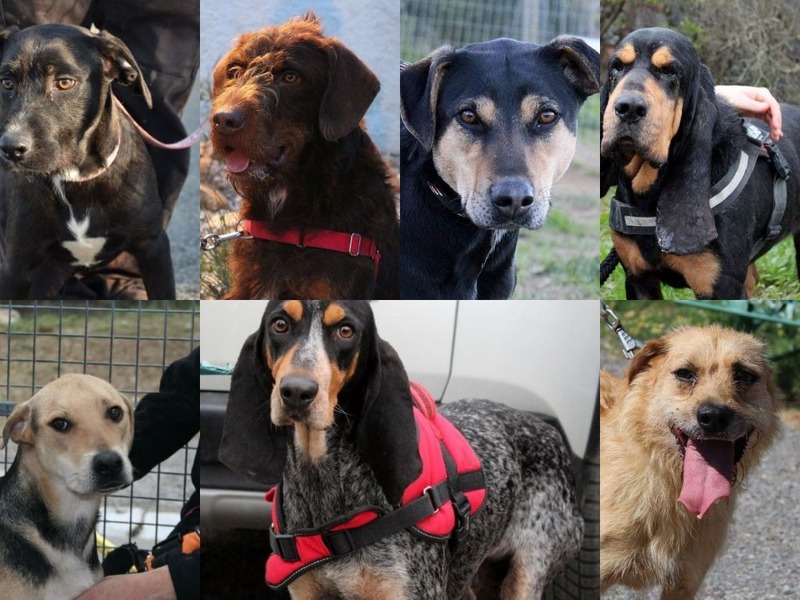 Good luck to Loubi, Kakao, Trudy, Darco, Billy, Douce and Bébé in your new lives! Up up and away! Adoption of a mucky pup and 2 lucky pups! Who remembers when Camboui arrived at the beginning of the month? This young labrador had clearly been playing somewhere very messy, and was almost grey with dried mud! Despite a few warm days, the ScPA dog-washing season has not really got underway, so although he is looking a bit better, he still needs a wash.
That didn’t put today’s family off, though! Camboui has left for his new home, and lots of fun is on the way. 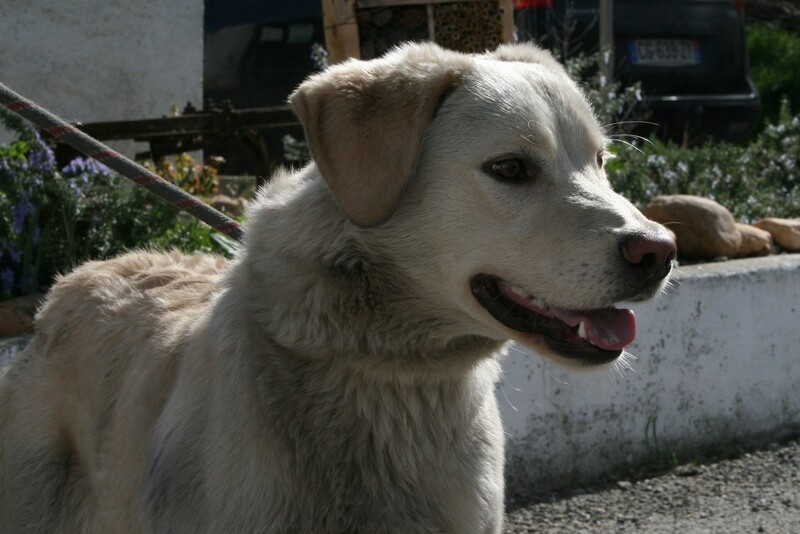 Born last July, this young labrador cross is very much still a puppy, and is full of energy. Wonderful for him that he has been adopted so quickly, and as we so often say, if only all our dogs were this lucky! On the subject of lucky dogs, today we also said goodbye to Apolline. She is one of six hunt type dogs who were found at the ScPA gates one morning. Five were together and one arrived a couple of days later, but we are pretty sure they knew each other in a previous life; probably as kennel mates and probably as breeding stock for a hunter. We have no idea why or how they were brought to the ScPA, but everyone breathed a sigh of relief when ten days passed without them being collected. 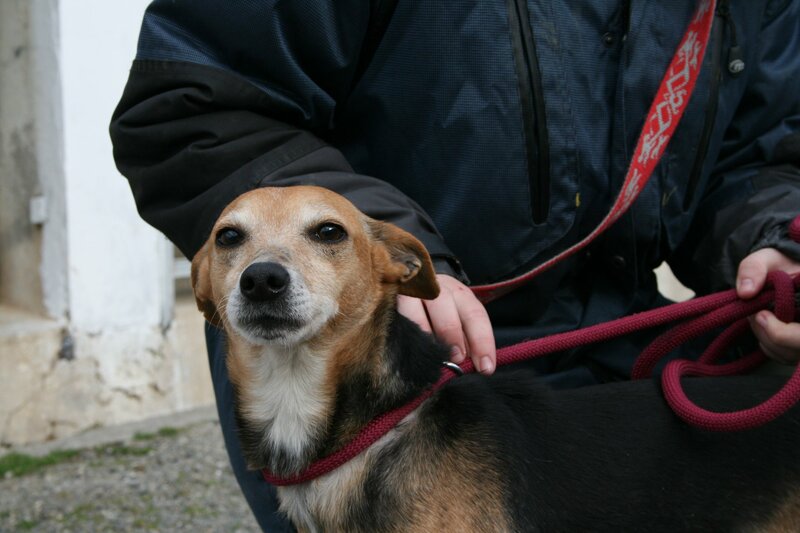 Apolline is a fabulous whippet-beagle cross (well, that is the vet’s best guess). She is slightly timid, but in that lovely way that just makes you want to cuddle her. And she loves cuddles. No one was surprised when some visitors fell head over heels for her today. She is the first of the six to start her new life, but we hope the others leave soon, If you like beagle or spaniel types, (and who doesn’t! ), you should take a look at their albums. They are all named after Greek gods (mostly goddesses, actually) and are all young dogs, all well socialised and as we so often say, coming to the ScPA is probably the best thing that could happen to them. Today’s other leaver was Tom, a young French bulldog who was abandoned recently. Yes, it is quite unusual for the ScPA to have dogs of this breed brought in for rehoming; normally they have owners who come to collect them in double quick time. This time, however we knew from the outset that someone was going to be very lucky. Tom is fine with other dogs and cats, but his relationship with children is slightly more ambiguous. A couple of families with children had already been to meet him; one of them left with Ziggy, and the other will come back and look again. Today’s family does have children, but they are slightly older, and Tom seemed to really like them. So less than a week after his arrival, Tom has a new home, and we wish him lots of happiness as we do to today’s other leavers. we have two lovely leavers to tell you about today. 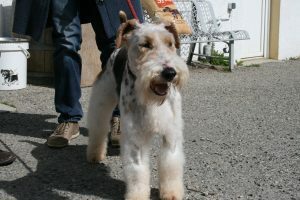 First off we said goodbye to Cuba, a 6 year old fox terrier who has gone to to live in the UK. Susanna his new mum, has been following DRC for years, and for the last couple of months has been looking for a dog to share her life and that of her remaining dog, who was lonely since losing her pal. When she saw Cuba, Susanna, wrote to ask all about him, and having decided he was the one for her, set about making plans to come and collect him. Today she arrived at the refuge to meet a newly spruced up Cuba! Yes, Angelique came in to give him a haircut, so he could look his best before leaving. And what a difference it has made. Susanna was delighted with him, and as we speak she and Cuba are making their way back to the UK, via a friend in the Dordogne, where Susanna used to live. Of course we will pass of news and pictures in due course. Doesn’t he look fantastic now, though? A huge thanks to Angelique, and of course to Susanna for coming all this way to collect Cuba. He is worth is though; what a great dog! Today’s other lucky dog was Bouboule. He was brought back recently for reasons that are not worth mentioning here. When a dog who is fine with other dogs and cats is brought back as being neither, you know something is up. At almost 12 years old, Bouboule’s chances of finding a new family were not great. 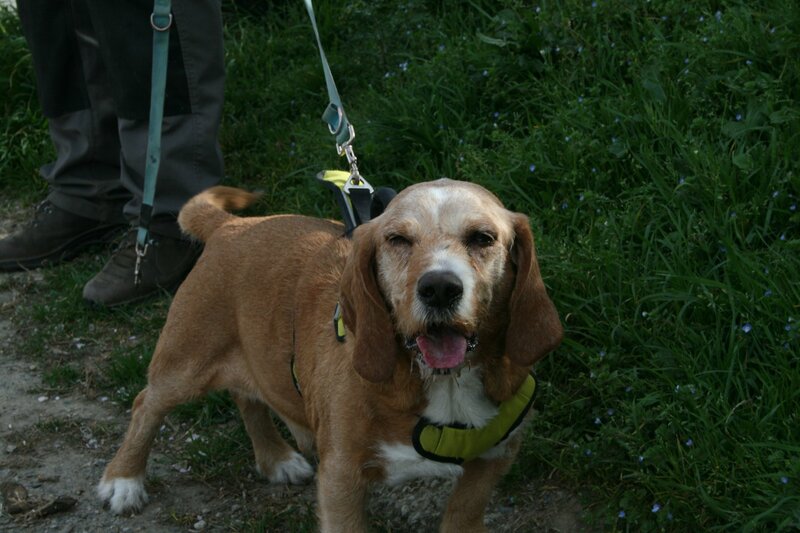 However there are some wonderful people out there, and today Bouboule left with a long term foster family who will love him and care for him, which is what he, and all our other dogs need, but the elderly ones perhaps more than most. Many thanks to them for opening their hearts to this elderly gentleman. We hope he has many happy and healthy years ahead of him. There were some other people looking for dogs, so hopefully more good news is on the way! A very sunny day brought the adoption of six year old Prune. 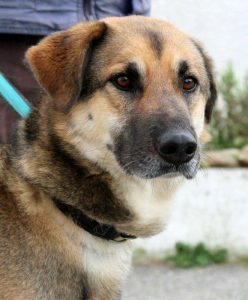 This lovely shepherd cross was brought back for rehoming three weeks ago with a very impressive CV; calm, obedient, good with other dogs and children. 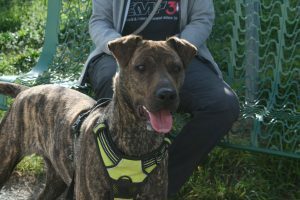 It is a shame that the family who adopted her when she was a puppy could no longer keep her, but at least she came back to the refuge as a good canine citizen, not a wild dog who had not been socialised, as is sadly so often the case. And one thing was for sure; whoever adopted her would be very lucky. A family came to the refuge earlier this week looking for a canine companion. There were two dogs they liked, and had to decide between them, so they returned several times to make sure they were making the right decision. Although some people seem to think otherwise, adopting a dog really should be a lifetime commitment, and it is worth taking the time to make sure of your choice! I have a feeling that if everyone did this, there would be far fewer failed adoptions. As we have said before, it is well worth asking advice of the staff when trying to select a dog. When the ScPA knows as much about a dog as they do about Prune, choices are often easier to make. Staff were able to tell Prune’s potential new family about her likes and dislikes. This is why it is far better for a dog if they are brought in for rehoming in a responsible manner. But in any case, it is important to take dogs out on a walk and away from the refuge environment; it is only there that so many of them relax and show their true personalities. You will be surprised at how many of them recognise you if you pay them a second or third visit; that is where the bond can really start to grow. Lucky Prune has started her new life and we hope she will be very happy. Don’t forget the refuge is open tomorrow afternoon, and we hope to bring you more good news. After a relatively short three and a half months at the refuge, Dali left for his new home yesterday. 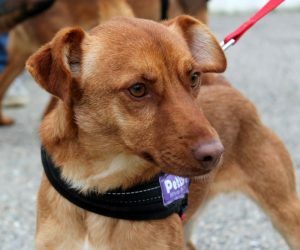 He has been on this site as one of our “hidden gems”, by which we mean a dog who has trouble getting noticed, but who is definitely worth a second (and third!) look. Sometimes dogs like this need a “champion” at the refuge, ie someone who knows them and is happy to guide a potential adopter in their direction. It is easy to pass by the perfect dog when there are a hundred looking at you with hope in their eyes. On this occasion the family was drawn to a couple of other dogs, but for various reasons (children and cats in the family,) they were just not right. A quick chat to staff helped narrow the field to a couple of dogs who had all the desired qualities but who were also child friendly. This is how Dali found his new home. When adopting don’t hesitate to ask the advice of staff or volunteers or anyone who knows the dog. Dali is very glad this family did, that is for sure! If all goes according to plan there will be news tomorrow, so see you then! 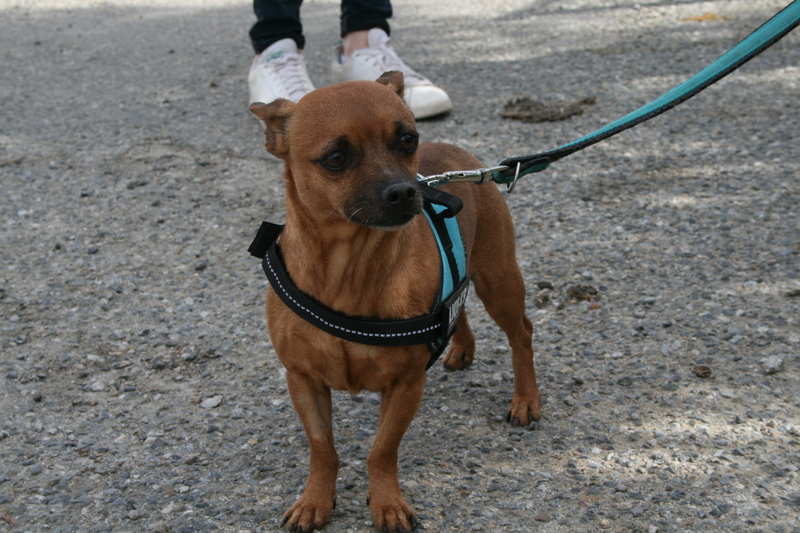 We had three adoptions today, and as two of them were of tiny older dogs, that is great news. First of Fullck. He was found and brought in towards the end of February; This 9 year old lad was identified, but his owner’s details were not up to date. 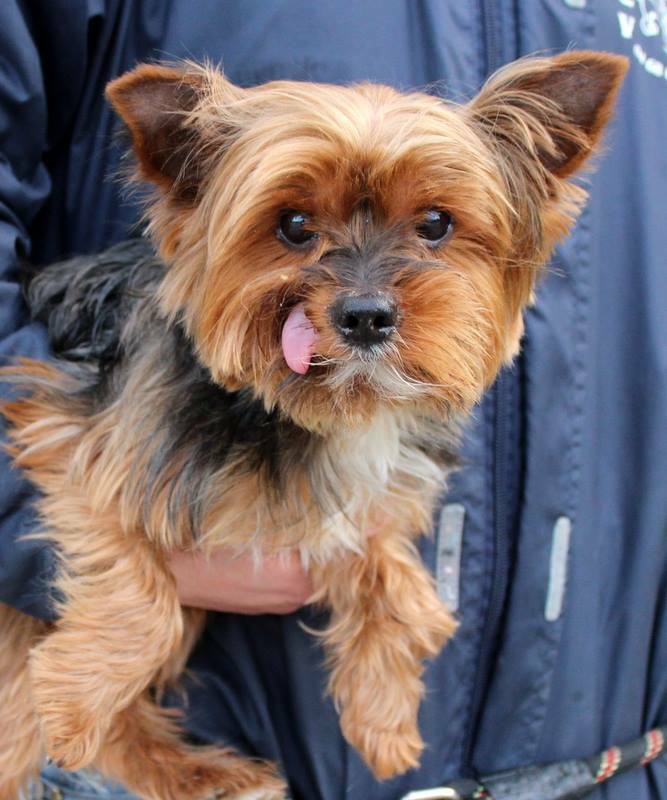 So after ten days had passed without them coming to collect him, this little yorkie was looking for a new home. At first no one appeared to be interested in him. But finally a couple came to see him and decided to test him with their female yorkie. Today’s meeting went well and so Fullck has a lovely new home. Huge thanks to them. We also said goodbye to little oldie Mini Goliath. He was brought in following the death of his owner, and at first he was terrified. The first time I met him I thought I was going to lose a finger, but once out of his kennel, he perked up. It must be terrifying for any dog to find themselves in a noisy kennel after 9 years in a loving home, but especially so for a dog that weighs a kilogram or so.A family came to meet Mini Goliath today, and he was as delighted to leave as they were to adopt him. Both these little dogs were over 9 years old so count as “seniors”. This means their adoption fee was just €80. Considering they are now castrated, identified and vaccinated, it is hard to see why some people accuse the ScPA of making money from the animals’ misfortune. Today’s other leaver was a young dog who has been with us since early November. We knew something of her history, as her former owner is well known at the ScPA…and not in a good way. When he failed to collect Zebuline, it really was her lucky day. Now sterilised, her life will be very different than the one that awaited her had she gone back home with this person. Today this fabulous brindle girl left for a new home! We wish all three of today’s leavers a wonderful time in their new homes and we look forward to news in the future. There were several people at the refuge looking for new companions, so we hope more good news is on the way. All adoptions are good. Make no mistake, we celebrate each and every one. But it is true that some will always be special, and today’s adoption of Tequila is one such adoption. 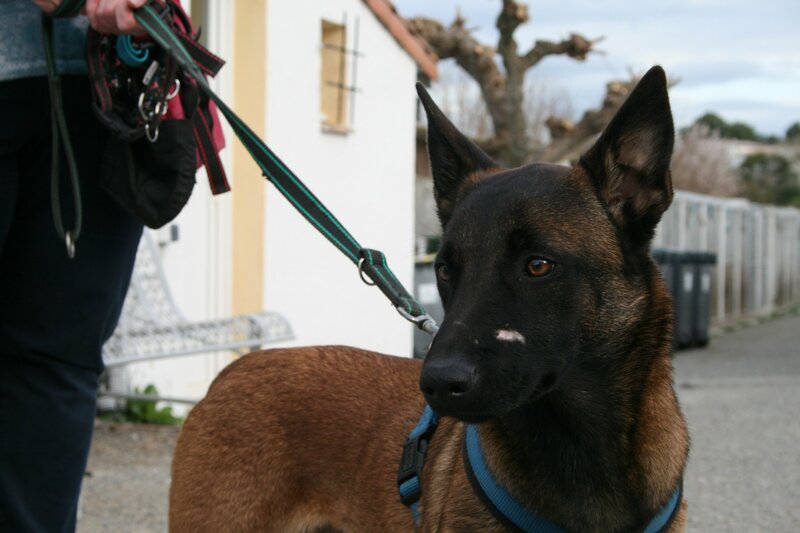 This young malinois arrived at the refuge as an unidentified stray towards the end of January. She had parvovirus, which in young or weak dogs can be fatal. In fact Tequila was in such poor condition that as well as having parvo, she needed an operation and was given her name due to her inability to walk in a straight line, as if she was drunk. For a while things looked very bleak for her. Luckily in early February employee Marion stepped in and took Tequila home to foster . Saying goodbye to any animal you have fostered is hard (many people like myself, who are failed fosters, know this only too well). But saying goodbye to a dog you have nursed back to health is even harder. But after 4 weeks with Marion and her family, Tequila was fully recovered, and needed a home of her own. The ScPA had to fend off a couple of people who wanted to use Tequila for breeding, and who were not interested once they knew she was sterilised (grr!). But then …JOY. As well as wonderful employees, the ScPA has amazing volunteers and just sometimes everything clicks into place. 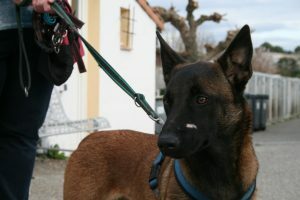 Catherine and her two girls, Amelia and Florie are often at the refuge walking dogs, and we all know that they love malinois. In fact they considered adopting Goldy last year, but the timing wasn’t right. This time, however the stars were aligned. Today Tequila left with her new family. Marion is understandably a bit sad, but overjoyed that Tequila has such a wonderful home, and that she will stay a part of the ScPA “family!. Huge thanks to her and also to Catherine and her family. 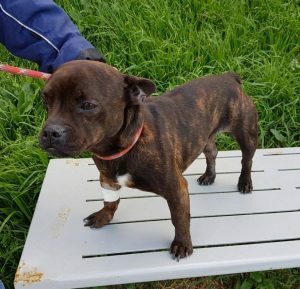 We will get plenty of news of Tequila, of course, and I wouldn’t be surprised if she comes back from time to time to get a cuddle from her foster mum! With the weather feeling very spring like, its the time of year to think about protecting your dogs against fleas and ticks. 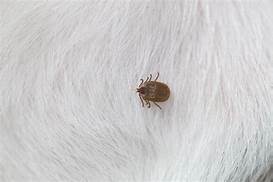 Lots of people coming to France are not aware that many of the French ticks carry a parasite known as Piroplasmosa Canis, which causes a potentially fatal canine disease called piroplasmosis or ‘piro’. These ticks are more active in warmer, wetter weather, so spring and autumn tend to be the danger periods. So, what are the symtoms of Piro? anaemia (to test for this, press a finger against your dog’s gum. When you release the pressure, the blood should return immediately. If the spot stays pale for a few seconds, it can indicate a problem). Dogs bitten by an infected tick typically start to show symptoms within 24 – 48 hours, and the disease can be rapidly fatal. The dog’s kidneys try to filter out the infected blood cells, and are themselves damaged in the process. It’s important to catch the disease as quickly as possible to limit the possibility of kidney damage, so play it safe and take your dog to the vet. How can you prevent Piro? If your dog is long-haired, keep him trimmed and well-groomed. The best prevention is to find and remove the ticks before they can bite. All French vets and pharmacies sell a tick removal tool. Wait several days after bathing your dog before applying the anti-tick treatment, and don’t bath him for a couple of days after application. Make sure the treatment is applied directly to the skin, not the hair. Keep a close eye on your pet. 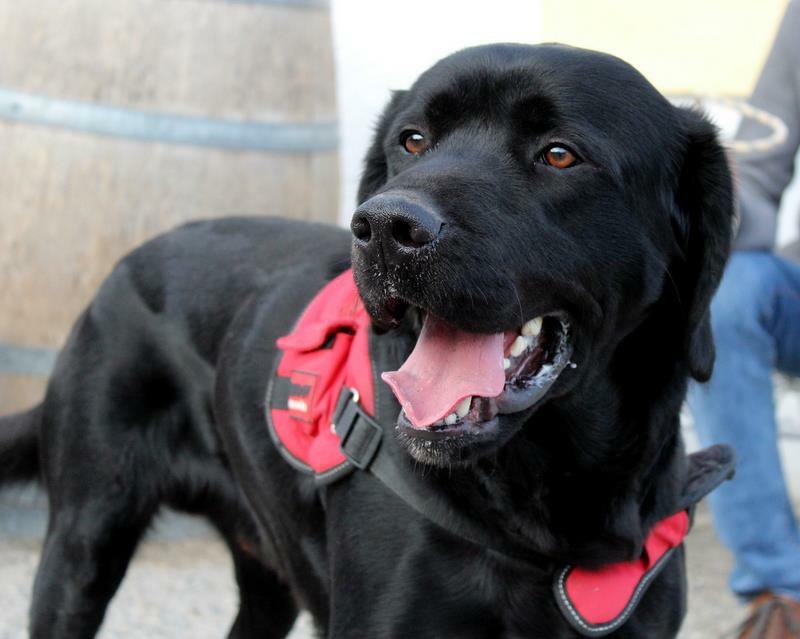 In addition to applying the anti-tick treatment, we also advise ia Scalibor anti-tick collar. This is impregnated with an active ingredient that gives six months of protection, and can be used with the Advantix without fear of overdosing to give maximum protection. If you catch the infection very early, there should be no long-term consequences. In 80 or 90 percent of cases, dogs develop a degree of natural immunity after being bitten. This means that most dogs have the disease once, then never again. So prevention with Advantix, a Scalbor collar and quick action should you notice the symptoms, keeps your dog safe and sound. This has not been the best week at the ScPA. 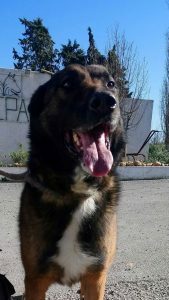 Apart from the death of poor Pato, who had spent three years waiting for a new home that never came, we had four dogs brought in for rehoming in just one day (yesterday). And that is not including the other dogs who were found as strays and brought into the Pound. So everyone was in need of some good news. On Thursday a couple came along to adopt a second dog as a companion to their poodle/ lab cross, Zero. 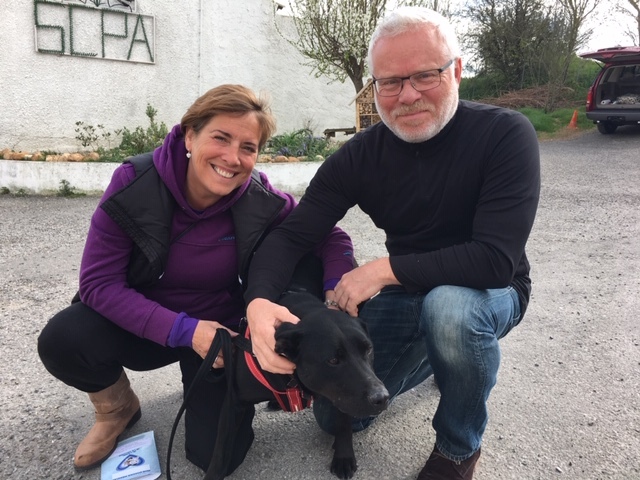 Caroline and Andrew were initially interested in one of the recently arrived staffies, and were willing to jump through all the administrative hoops that this would involve. However while doing a tour of the refuge, their eye fell upon lab cross Sally. She is one of Mattie’s pups and is one of the 7 dogs left behind when their owner moved house last summer. So far Mattie is the only one to be rehomed (she was less traumatised than the others and is doing wonderfully with our friend Angie), but the puppies (who are now 18 months old) are making enormous progress at the refuge, thanks to the staff and volunteers. Progress will be far quicker away from the ScPA, however, especially with another steady dog as guide. So it was fabulous that Caroline and Andrew have decided to offer a home to Sally. They know there is work to be done, but are well prepared and of course we will be there to offer help and advice should they need it. Second to leave was Rockett. 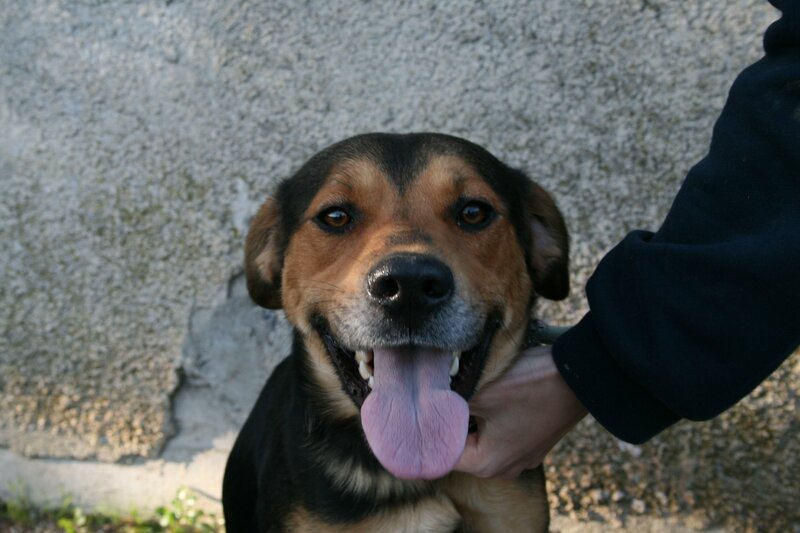 Now this dog has only recently arrived and it was immediately clear that he would have no trouble finding a home. But of course it had to be a good home, not just someone who was attracted by his stunning looks. Because this is one handsome boy. Not quite two years old, Rockett is fine with other dogs, children, cats, and is only at the refuge because his family moved to Canada and were “unable” to take him. A family came along to meet him this week, and today, after a quick visit to the vet for a quick “snip”, it was lift off for Rockett. He has a great life ahead of him, with a sporty family who will take him everywhere with them and who love him already. There was another adoption today, also of a dog who was brought in for rehoming. They said that he was wonderful; affectionate and well behaved. But sometimes dogs of this shepherd mix have trouble getting noticed; there are usually quite a few of them at the refuge at any one time. Many of them are like Jaffa, calm, steady and real hidden gems, so it is worth finding out more, as did today’s visitor. We hope that Jaffa’s new home is every bit as wonderful as he deserves. His former owners gave him up in preference for a pair of pedigree dogs, so we hope they are even more wonderful than Jaffa, or we don’t reckon much to their chances of staying put! So not bad for a Saturday and a much needed morale boost after a “complicated” week. There may be more good news on the way tomorrow, you never know.